Mother Nature beckons us to step outside during the summer months, and Great Bend offers numerous ways to enjoy her bounty from dawn to dusk. Animal lovers view the world’s unique wild creatures at the zoo. Water enthusiasts canoe the Arkansas River or boat on a city lake. Birdwatchers spot Canada geese and black-crowned night heron at nearby Cheyenne Bottoms Wildlife Area, the largest inland marsh in the country. Without binoculars, stargazers see meteors and the Milky Way in the vast dark sky. Whatever your pleasure, spending the weekend in Great Bend is the ideal way to get back to nature. 8 A.M. Start your day at Mitchell’s Bakery, known for its apple fritters; the cinnamon rolls and cinnamon twists are yummy favorites, too. You’ll be working up an appetite, so consider stashing a bag of chocolate chip or sugar cookies to snack on later in the day. 9 A.M. A great place to walk off breakfast is the Great Bend Brit Spaugh Zoo, home to reptiles, mammals, birds and insects from all seven continents. Visitors can also enjoy an aquarium housing different species of fish from all over the world. You even might have the opportunity to watch an operation on an injured bird through a one-way mirror in the Raptor Center, where a wing span chart, an eagle’s nest, and a raptor’s eye view of the zoo are among the exhibits. While here, make sure the kids purchase fish-food bags and then head out to the pond to feed the catfish and watch the turtles, geese, swans and ducks. 11:30 A.M. At Great Bend Coffee, bite into a brick-oven-baked hot sandwich or pizza and wash it down with an Italian Cream Soda or the popular Tall-Paul, a breve with caramel and hazelnut. The Wildcat sandwich, with chicken, artichoke and sun-dried tomatoes, and the Torino sandwich, of smoked lean turkey and cheese, are favored by customers and are served with thick kettle chips and a crisp dill pickle. If you prefer brick-oven-baked pizza, order the popular Milano, with mild Italian sausage and mushrooms, or create your own combination of toppings. 1 P.M. The city’s Stone Lake and Veteran’s Memorial Park Lake both allow fishing with a state fishing license. Limited boating is allowed on both lakes (see greatbendks.net for more information). You also may put your kayak or canoe in the Arkansas River at Stone Lake and paddle away. If you prefer, don your bathing suit and cool off at the Wetlands Waterpark, with its tipping bucket, water slides for all ages, spray park, zero depth splash pool, and numerous colorful shade structures. 3:30 P.M. Download walking tour brochures from visitgreatbend.com, and take a leisurely stroll through downtown. The Birdhouse Tour pamphlet lists the artist’s descriptions of more than 70 uniquely-decorated three- to five-foot-tall birdhouses perched in front of businesses. The Kansas Quilt Walk and Great Bend Mural Project guide describes the historic quilt blocks painted on the sidewalks surrounding the courthouse square; the oldest block featured is “The Rocky Road to Kansas” dating to the Santa Fe Trail, on which the historic courthouse was built. Murals painted by professional and amateur artists depict the city’s past and present on more than a dozen business buildings. When you need a break from the sun, step inside the quaint boutiques and other shops to pick up a souvenir. 5:30 P.M. While perusing the dinner menu, sip Kansas-made Rosewood wine or Tallgrass beer at The Page, an American Bistro. A customer favorite, the prime rib is only served on Saturdays. Other popular entrees include the steaks, encrusted with a five-peppercorn blend and topped with butter, and the chicken parmesan, a hand-breaded chicken-fried chicken served on a bed of spaghetti noodles smothered with house-made marinara or alfredo sauce and topped with mozzarella. Or, dine at Kiowa Kitchen, a Barton County tradition for more than 30 years, where you’ll feast on Mexican food such as cheese enchiladas and chile rellenos. 7 P.M. Sample the locally-produced, award-winning signature Blackberry Cabernet Sauvignon and other wines at the Rosewood Wine Cellar. Feel free to browse the store filled with, among other items, jellies, honey and crackers, marshmallows, cowboy candy, s’mores, bath products and candles that are Rosewood Creations products made by client-employees with developmental disabilities. 8 P.M. Up N Rollin Skate Center is the perfect place for kids of all ages to burn off energy; as at most rinks, roller skates are provided. Or, for some friendly competition, check out Walnut Bowl and Mini-Golf to see who scores the highest while bowling or the lowest number of golf strokes. OVERNIGHT If you like to rough it in the great outdoors, reserve a spot in the primitive camping area at Cheyenne Bottoms Wildlife Area a short drive away. Other campgrounds and RV parks, some including full amenities, also are available. Prefer comfort? Sleep in luxury on a memory foam mattress at the recently remodeled Baltzell Lodge, a locally-owned establishment featuring the nostalgia of a 1950s exterior and modern day conveniences inside, or stay at one of the several other motels. 7 A.M. Rise, shine and grab a filling breakfast to sustain you for the busy Sunday ahead. The home-made buttermilk pancakes cover a dinner plate at Granny’s Kitchen, where the build-your-own omelet is another popular item. Most customers add the maple bacon as a side. 8 A.M. Put on your hiking boots or hop on your bike and follow the seven-mile paved levee trail that runs along the Arkansas River; hikers and off-road bicyclists also can explore the river bed along unpaved paths. Maps of paved and non-paved routes and trails can be downloaded from visitgreatbend.com or greatbendks.net. The city’s Veteran’s Memorial Park has walking and fitness trails, a lake with a sand beach, an 18-hole disc golf course, sand volleyball, playground equipment, a tot play area, and even a dog park if you bring Fido along. A lighted skateboard area, BMX track, horseshoe pits, and playground all are available at Brit Spaugh Park. ALTERNATIVE Pack your own lunch and follow the Wetlands and Wildlife Scenic Byway, a 77-mile-long drive through wetlands and mixed grass prairie filled with an abundance of wildlife and topped by an immense blue sky. 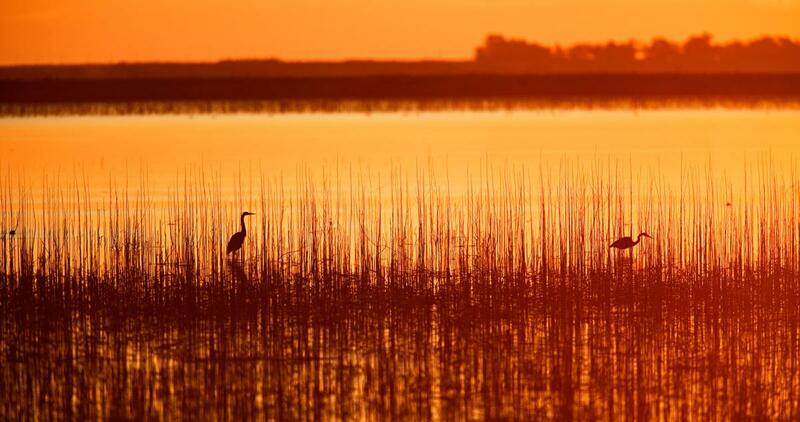 The Byway connects two of the world’s most significant natural wetlands, Cheyenne Bottoms and Quivira National Wildlife Refuge, that each year host millions of migrating birds, including waterfowl and shorebirds. End your adventure at the Kansas Wetlands Education Center, where you can enjoy your lunch under a picnic shelter before stepping inside. 11:30 A.M. Grab brunch at The Rack Billiard Café, where the kids can play on one of eight pool tables while you linger over coffee after savoring the popular breakfast burrito or steak and eggs. Cheeseburgers and the 8-ounce rib eye are favored lunch items. 1 P.M. 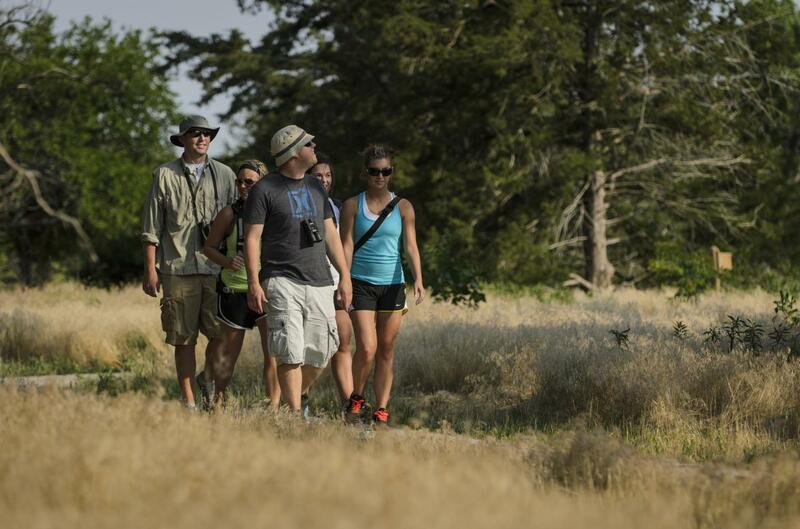 Arrive at the Kansas Wetlands Education Center (admission is free) and sign up for one of the guided van tours of Cheyenne Bottoms Wildlife Area. We suggest a 2:30 p.m. tour, which will give you ample time to look at interpretive displays, natural history collections, and historical and cultural artifacts explaining the importance of the wetlands, identifying the animals and plants living here, and describing the geological formation of the area. Be sure to take in the panoramic view of the marsh and look through the available binoculars or spotting scope to get a closer look at wildlife on the water’s edge; then, step outside and walk to the observation point, where you might see little blue herons or mallards. *Note: When planning your trip, be sure to check the Center’s website, wetlandscenter.fhsu.edu, as an exhibit renovation is being planned during which tours will be available, but the Center may be closed. 2:30 P.M. The 30-minute Get To Know Cheyenne Bottoms Tour stops at the observation tower, gives a glimpse into the pool systems, and provides a history of Cheyenne Bottoms. The 90-minute Deluxe Tour provides a complete, interpretive view of Cheyenne Bottoms Wildlife Area and nearby Cheyenne Bottoms Preserve, focusing on bird and wildlife identification, and includes a stop at the Highway 4 overlook. During both tours, binoculars and bird field guides are available to help you spot birds and wildlife pointed out by the guide. Upon your return, ask for a map, a self-guided driving tour guide, and flora and fauna checklist before leaving the Center, or download them from the Center’s website. Then embark on the George Stumps Nature Trail for a walk through the woods to see great horned owls, white-tailed deer, orioles, and other wildlife. House wrens, eastern bluebirds, and tree swallows use the nest boxes along the half-mile-long trail. 5 P.M. Wetland birds are most active in the late evening or early morning, so this is a good time to strike out on your own using the Center’s resources you’ve collected. Look for wading birds such as herons, egrets, ibis, avocets, and stilts as well as pelicans, cormorants, and perhaps ducks; and, watch for grassland nesting birds as you drive by upland prairie. Feel free to stretch your legs with a brisk walk along the dikes and be sure to climb the observation tower or stop at the Kansas Highway 4 overlook, as both provide a great view of the wetlands at sunset. AFTERDARK Look up. The Milky Way appears like a band of light across the galaxy, with summer constellations including Libra, Scorpius, and Sagittarius for those who enjoy astronomy. No binoculars are needed to see the Perseid meteor shower that typically peaks around Aug. 12. The Kansas Wetlands Education Center will host a Perseid meteor shower viewing party at 9 p.m. on Aug. 10 near the picnic shelter. The night will include activities focusing on meteors, constellations, and other astronomy-related topics. WHATEVER YOUR PLEASURE, SPENDING THE WEEKEND IN GREAT BEND IS AN IDEAL WAY TO GET BACK TO NATURE.